At the heart of Tierra Nueva’s mission is that mainstream people and those on the margins would hear and experience together the very Good News of God’s love and liberation in Jesus Christ. 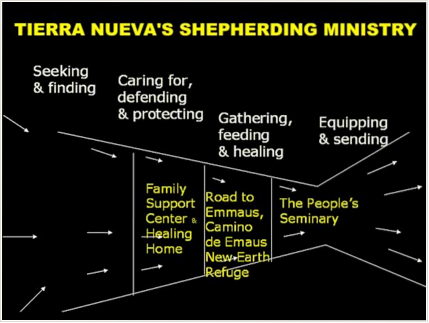 Tierra Nueva’s training center, The People’s Seminary, offers courses equipping people to read the Bible and do ministry with people on the margins. Scholars and leaders from all over the world have come to teach and learn together at The People’s Seminary, together with farm workers, ex-offenders and people who serve at the margins. Our desire is to see the body of Christ equipped by both the people themselves among who we minister and the academic community and church leaders committed to grass-roots ministry and mission.